Widely used by industrial and commercial applicators. "Bare Ground,” means exactly that. 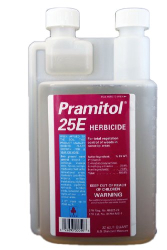 Wherever Pramitol is applied, nothing will grow for one year or more, (in optimum conditions). Can be used around buildings, storage areas, fences, recreational areas, fuel tanks, roadways, guardrails, airports, highway medians, pipelines, railroads, lumberyards, right-of-ways, and other similar areas. Controls johnson grass, bindweed, and other hard to control weeds. 1 quart treats up to 2,500 sq. ft.